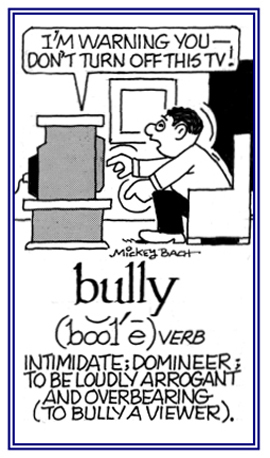 To harrasses, hurt, or threaten smaller and weaker people: A bigger boy would often bully or pick on Jimmy when he and his classmates were playing outside at school. Mark is known to bully his younger brother whenever they are doing something together. 1. A built-in platform for a bed, as on a ship: Brittany chose the top bunk in the cabin because it was close to the porthole. 2. Informal: any bed: Lisbeth's roommate shouted that she should grab a bunk before the other people came into the room. 3. A cabin used for sleeping quarters; such as, in a summer camp: At the summer campground, Hank slept in one of the bunks reserved for visitors. 4. A trough for feeding cattle: The farmer pitched some hay into the bunk for the cattle. 5. 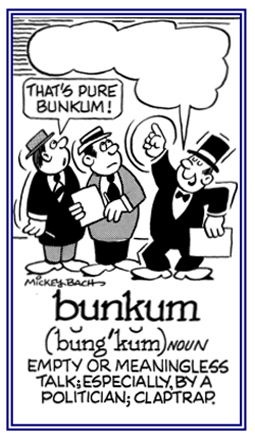 Etymology: bunk is probably a shortened form of bunker, which is Scotish for "a seat" or "a bench" and is of uncertain origin; possibly from a Scandinavian source; possibly from, Old Swedish, bunke, "boards used to protect the cargo of a ship" or from Scottish English, meaning "chest, box". 1. An underground shelter; especially, one that is built for troops, with a fortified gun position above ground: Naturally, after the war, many bunkers were abandoned by the troops. 2. A sand-filled hollow on a golf course, built as a hazard: The golf champ hit his ball into the bunker and had difficulty getting it out. 3. A fuel-storage container on a ship: The bunker was filled with 25,000 liters of gelled fuel for the sea voyage. 4. A large outdoor bin or chest: Farmer Joe kept his summer picnic equipment in a bunker out by the barn. 5. Etymology: from Scottish, "seat, bench", possibly a variant of banker, "bench" (1677). 1. Floats that are moored in water to mark a location, to warn of danger, or to indicate a navigational channel: The coastal city replaced the buoys that were lost during the severe storm. 2. 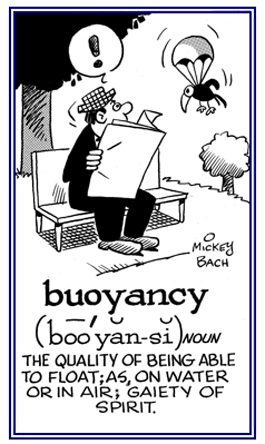 Etymology: From Old High German bouhhan, "buoy", and is elated to "beacon". 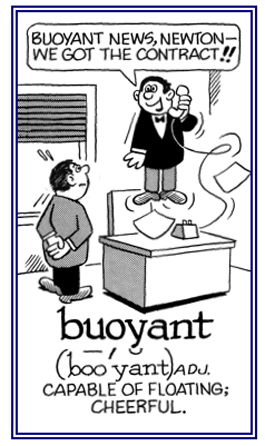 The term also exists in French bouee, Italian boia, and Spanish boya. 1. To keep afloat or aloft: Jim saw a glider buoyed up in the sky by air currents. 2. To inspire or to encourage: The football team was buoyed up for the game because they were all in good physical condition and they were convinced by their coach that they had a very good chance of winning the championship. 1. 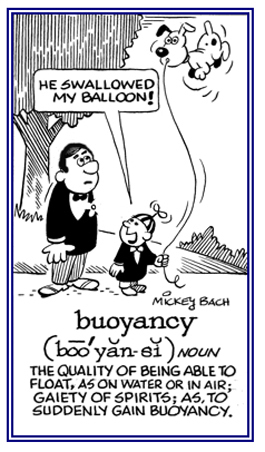 The capability or tendency to stay afloat; as in a liquid, in the air, or in gas: The fisherman was testing his boat to see if its buoyancy was still sufficient. 2. A upward force that a fluid exerts on something that is less dense than itself: Rubber rafts have a buoyancy that allows people to float even when they can't swim. 3. 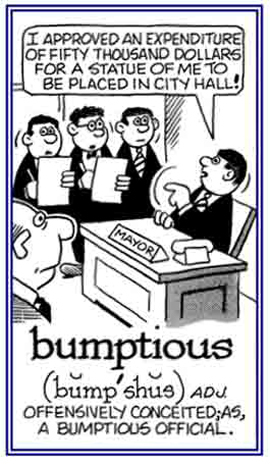 An ability to recover quickly from undesirable situations; such as, a failure or a disappointment: Matt was a man of remarkable buoyancy even though he was losing money in the stock market. 4. 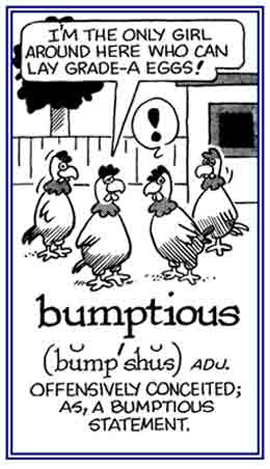 Lightness of spirit; cheerfulness: Carl had a great deal of buoyancy when he found out that his brother was able to get a good job after graduating from the university. The buoyancy of the elderly couple, who were celebrating their sixty-fifth wedding anniversary, was an indication that they were very happy. © ALL rights are reserved. 1. A reference to being able to float: Cork is a very buoyant material, which cannot sink to the bottom of a container of water. 2. Pertaining to something that can cause things to drift in the air: Warm air is more a buoyant factor than cool or cold air. 3. Descriptive of being happy and confident: The two basketball teams were in a buoyant mood as they were about to play their game. 4. Relating to remaining at a regular or high level: The investors are convinced that there will be a buoyant economy in the near future. © ALL rights are reserved. To quickly grow, to expand, or to develop: Hot weather has burgeoned around the country faster than usual this year. The market for cell phones is burgeoning on a global scale. One of the dangers of so much rain and heat is that mosquito population is burgeoning and causing more health problems. A description of something that is developing, growing, and flourishing quickly: With all of the rain that has been falling and the heat, the weeds and grass have become a burgeoning problem in yards and along the sides of roads. The nation's burgeoning number of people without jobs has been increasing and causing serious financial problems. Showing page 11 out of 11 pages of 161 main-word entries or main-word-entry groups.